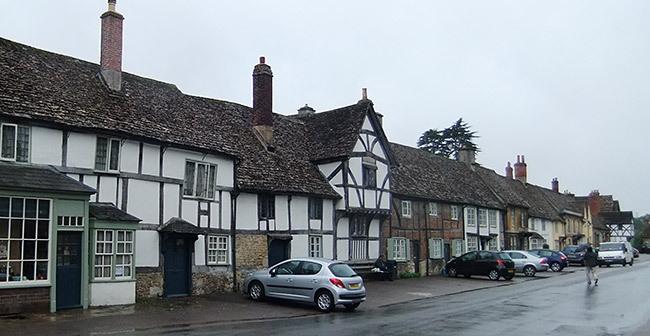 One of the most well preserved and unspoilt medieval villages in England. Most of the buildings date from the 13th to 18th centuries, giving it a genuine olde-worlde feel. Due to its unique historic character it has been used as a film location for many classic films, including 'Pride and Prejudice' and 'Harry Potter'. The village flourished during the medieval wool trade, and thanks to its isolation from major roads and highways, it has remained almost untouched since. The cobbled wide High Street is lined with an array of timber-framed houses and stone-built cottages, including the noteworthy 'Porch House' with its unusual dual storey timber-framed porch, and the 14th-c Cruck House, named after the massive exposed curved beam supporting both the roof and the main wall. One house, with Ashlar stone facing has a set of classical capitals. 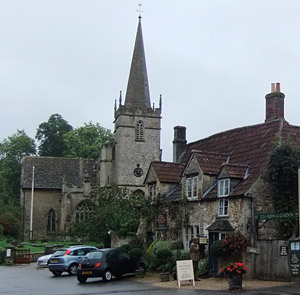 At one time Lacock had at least one pub on every street. The oldest remaining tavern is the 14th-c George Inn. The timber-framed Angel Inn, which dates from 1480, is named after the gold coin of the time that displays the figure of the Archangel Michael. It has a magnificently beamed interior and an old coaching yard. The Carpenters Arms has fine Georgian windows with moulded stone architraves. The High Street is a wide thoroughfare, which during mediaeval times hosted a three day fair and weekly wool and produce markets. Church Street, which runs parallel to the High Street, leads to the lovely 14th-c church of St Cyriac. The highly decorative tomb of Sir William Sharington (Treasurer of the Mint at Bristol) who initially converted Lacock Abbey to a dwelling, can be found here. Mainly of 14th and 15th century construction, the church layout is cruciform in shape, with a perpendicular fan-vaulted ceiling and a fine west tower and spire. The original settlement of Lacock stood at the edge of Melksham Forest, one of the royal hunting forests. St John's Hunting Lodge, next to the church, dates from the 16th-c. An old packhorse bridge and ford cross a tributary of the Avon, up Nethercote Hill lane, just opposite the lodge. 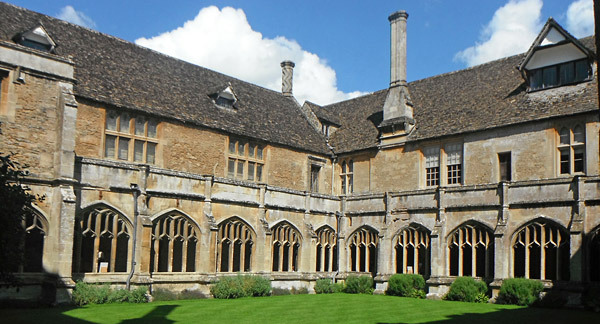 The National Trust owns most of Lacock, including the 13th-c abbey just east of the village. the abbey has surviving cloisters, sacristy, chapter house and a nuns' parlour. Following the Dissolution of the Monasteries, the buildings were sold to Sir William Sharington, who converted it into a grand Elizabethan mansion, with an octagonal tower, twisted Tudor brick chimneys and fine half-timbered gables. During the 18th-c it was restyled with several Gothic revival additions, including a great hall and gateway, designed by Sanderson Miller. The Tithe Barn, attached to the abbey, was built to receive the local tithes - a proportion of the crops, vegetables and fleeces etc. taken in lieu of rent from the abbey's tenant farmers. It has a magnificent timber roof that dates back to the 14th-c and has had many uses since the Dissolution. Today it provides a community space for coronation teas and craft markets. Built against the far end of the barn is an 18th-c stone-built domed lockup, once used to restrain any drunk and disorderly townsfolk overnight. The Augustinian nunnery and abbey was founded in 1232 on the banks of the river Avon by Ela, the Countess of Salisbury. The cloisters and chapter house still survive from the original abbey but most of the current building is responsibility of Sir William Sharington, who purchased it after its dissolution in 1539. 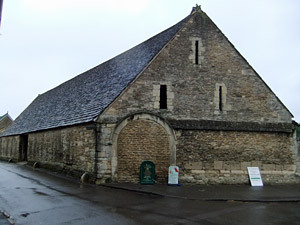 The abbey once housed one of the original copies of the Magna Carta, which was the property of the countess who was also a Sheriff of Wiltshire. The property passed to the Talbot family in the 17th-c, who later added the Gothic-style entrance hallway and great hall. It was during the 19th-c that William Henry Fox Talbot carried out some early photography experiments at the house. Examples of his pioneering work, including the first ever recognisable photograph, are on display in the Fox Talbot Museum near the abbey entrance.